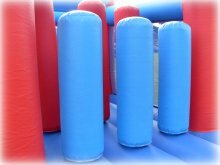 Our Inflatable Assault Courses have become some of our most popular hire items and we have versions available for use by both children and adults. 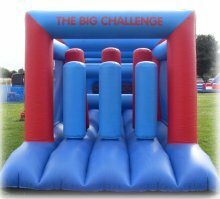 The participants race through the inflatable assault course in pairs through all the various obstacles with the first to the end the winner - this can be done with either individuals or teams competing against each other making it perfect for team building events and sports days. 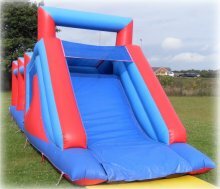 The inflatable assault courses have the highest turnover of users out of all activities which means everyone gets more than enough goes at fun days and parties and they can be very profitable for fund raising events. 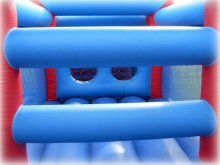 Each inflatable assault course features a range of obstacles including ramps, vertical biff-bash tubes, letter boxes, up and under bars, cargo nets, and slides. 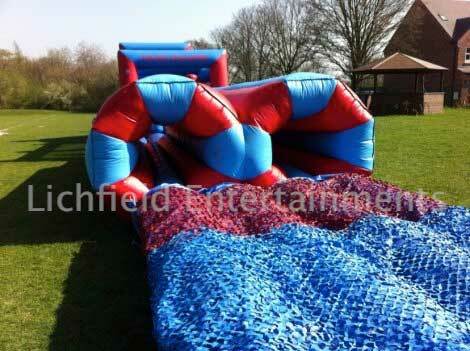 We have our red and blue 'Big Challenge' assault courses available in both childrens and adult versions. The childrens version is for kids up to a maximum age 14 and is available in either 43ft, 70ft, 95ft, or 120ft versions! The adult version is for all ages and is available in 70ft, 95ft and 120ft sizes. If 120ft isn't long enough for you then a pair of knock-over flip walls can be added - see video below. 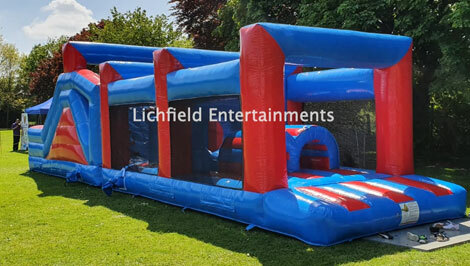 On the standard 43ft version Inflatable Assault Course the kids go up the ramp, dodge through two sets of biff bash squeeze under or between the mangle bars, dive through portholes and climb the cargo net to the top of the slide. On the longer versions inflatable tunnels and scramble net extensions are added.